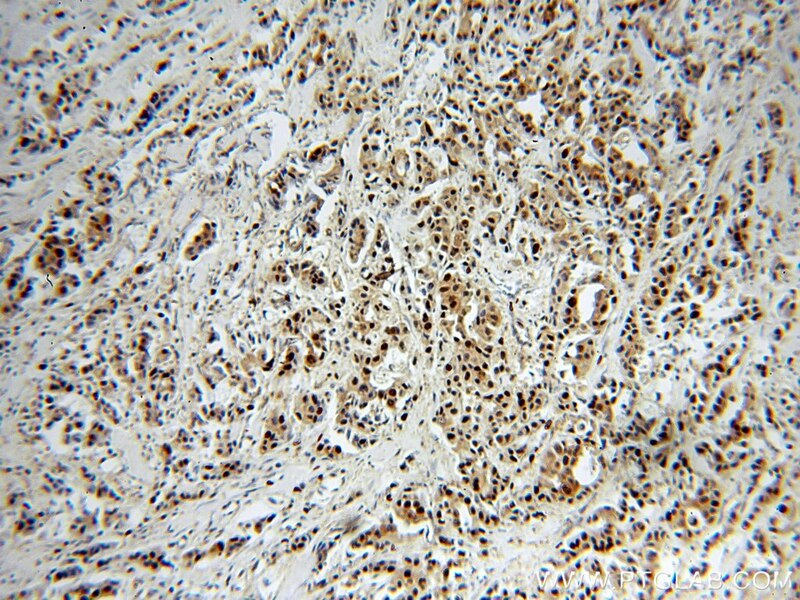 Immunohistochemical analysis of paraffin-embedded human gliomas tissue slide using 60097-1-Ig (PCNA antibody) at dilution of 1:1000 (under 10x lens) heat mediated antigen retrieved with Tris-EDTA buffer(pH9). 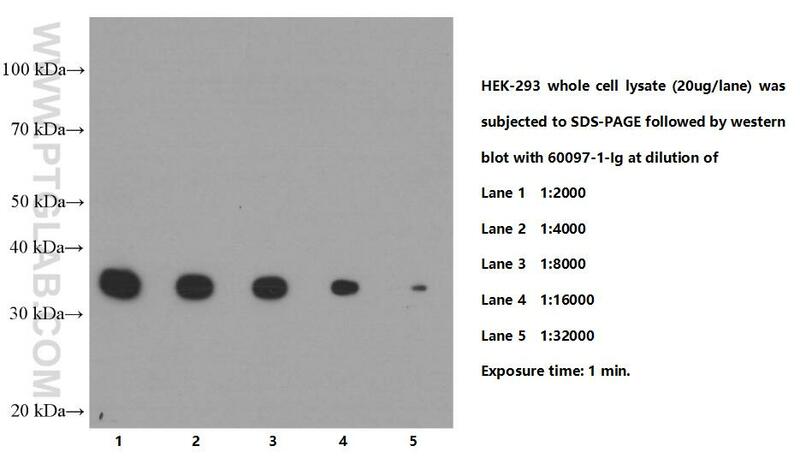 IP Result of anti-PCNA (IP:60097-1-Ig, 4ug; Detection:60097-1-Ig 1:300) with HepG2 cells lysate 3000ug. 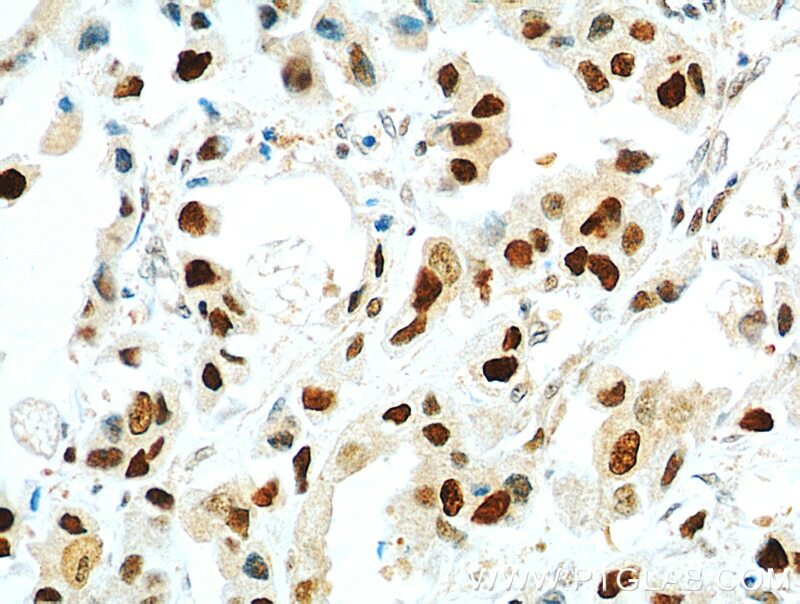 1X10^6 MCF-7 cells were stained with 0.2ug PCNA antibody (60097-1-Ig, red) and control antibody (blue). Fixed with 90% MeOH blocked with 3% BSA (30 min). 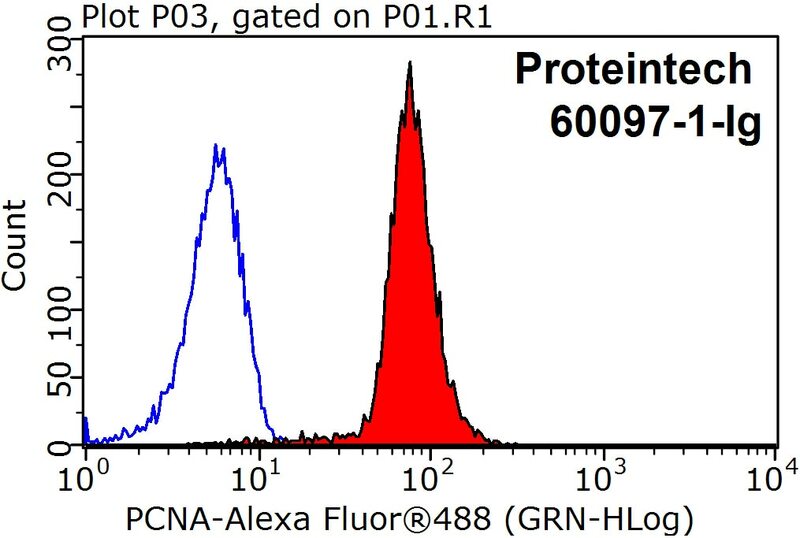 Alexa Fluor 488-conjugated AffiniPure Goat Anti-Mouse IgG(H+L) with dilution 1:1500. Proliferating Cell Nuclear Antigen, commonly known as PCNA, is a protein that acts as a processivity factor for DNA polymerase δ in eukaryotic cells. This protein is an auxiliary protein of DNA polymerase delta and is involved in the control of eukaryotic DNA replication by increasing the polymerase's processibility during elongation of the leading strand. PCNA induces a robust stimulatory effect on the 3'-5' exonuclease and 3'-phosphodiesterase, but not apurinic-apyrimidinic (AP) endonuclease, APEX2 activities. It has to be loaded onto DNA in order to be able to stimulate APEX2. PCNA protein is highly conserved during evolution; the deduced amino acid sequences of rat and human differ by only 4 of 261 amino acids. 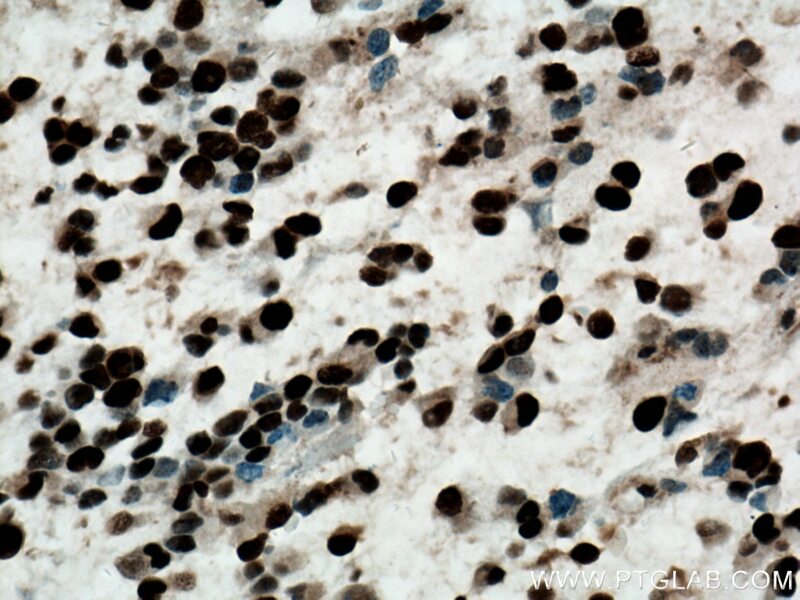 PCNA has been used as loading control for proliferating cells. 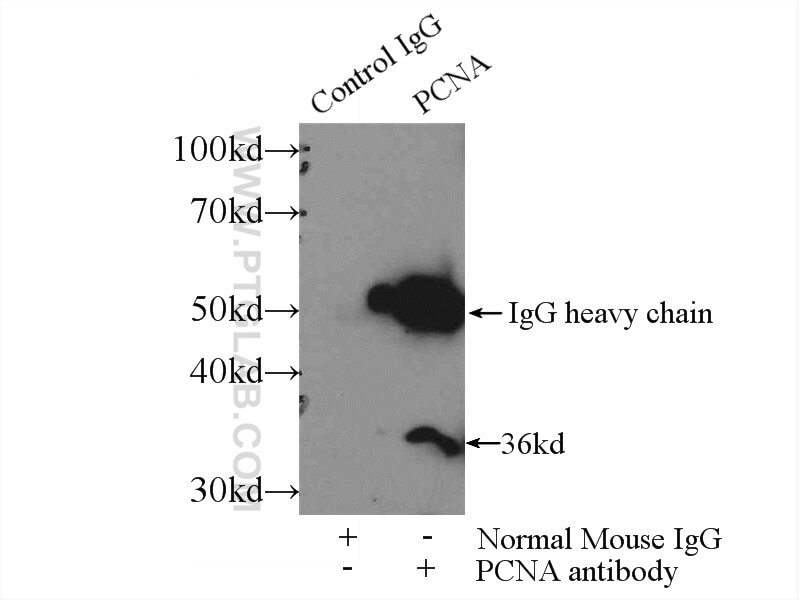 The calculated molecular weight of PCNA is 29 kDa, but modified PCNA is 36kDa （PMID: 1358458）. 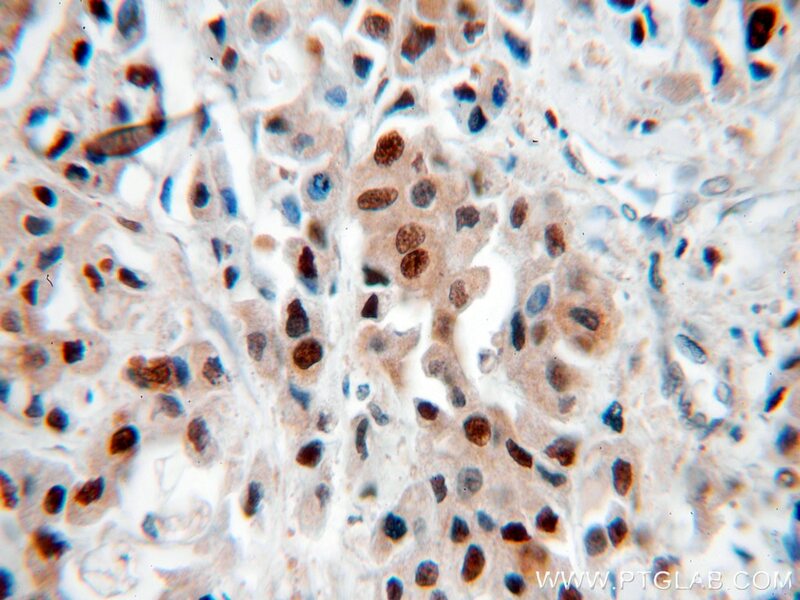 CXXC5 Associates with Smads to Mediate TNF-α Induced Apoptosis. Antisense long non-coding RNA PCNA-AS1 promotes tumor growth by regulating proliferating cell nuclear antigen in hepatocellular carcinoma. Enhancement of anti-tumor effects of 5-fluorouracil on hepatocellular carcinoma by low-intensity ultrasound. 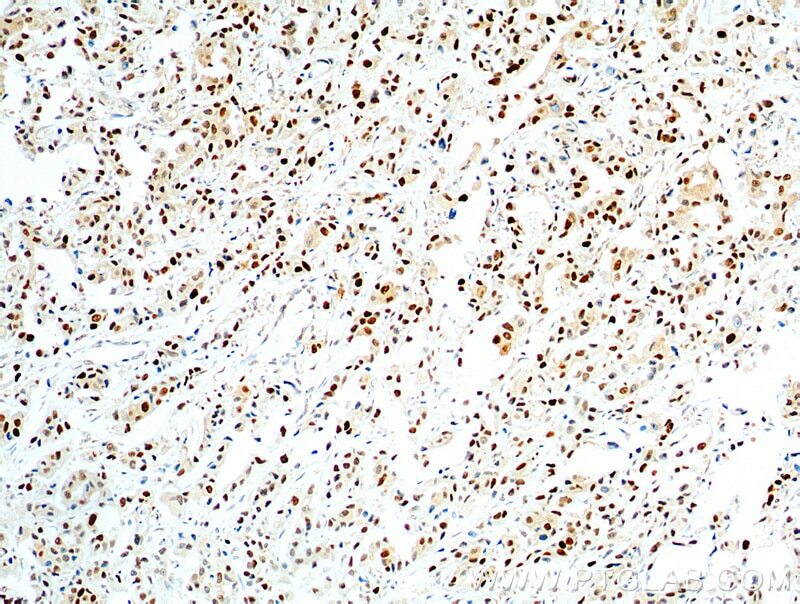 NKD1 correlates with a poor prognosis and inhibits cell proliferation by inducing p53 expression in hepatocellular carcinoma. 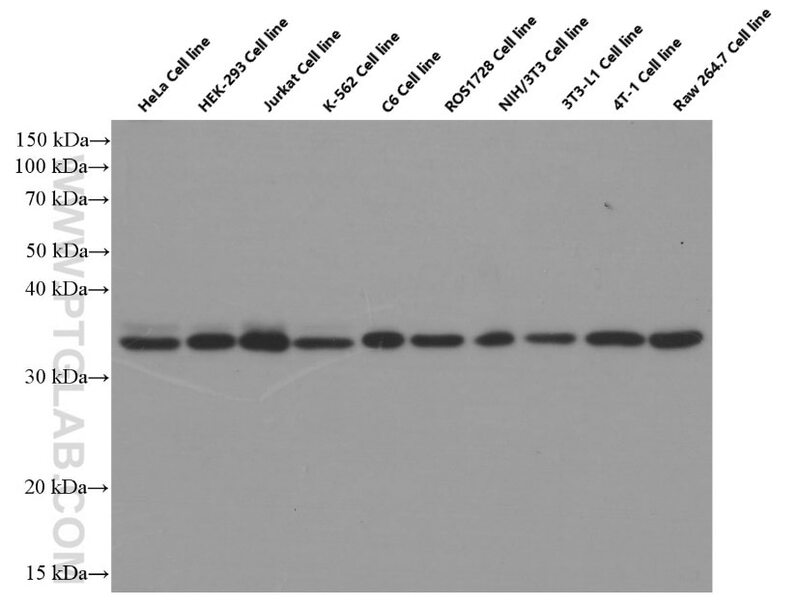 Effects of resveratrol on ARPE-19 cell proliferation and migration via regulating the expression of proliferating cell nuclear antigen, P21, P27 and p38MAPK/MMP-9. 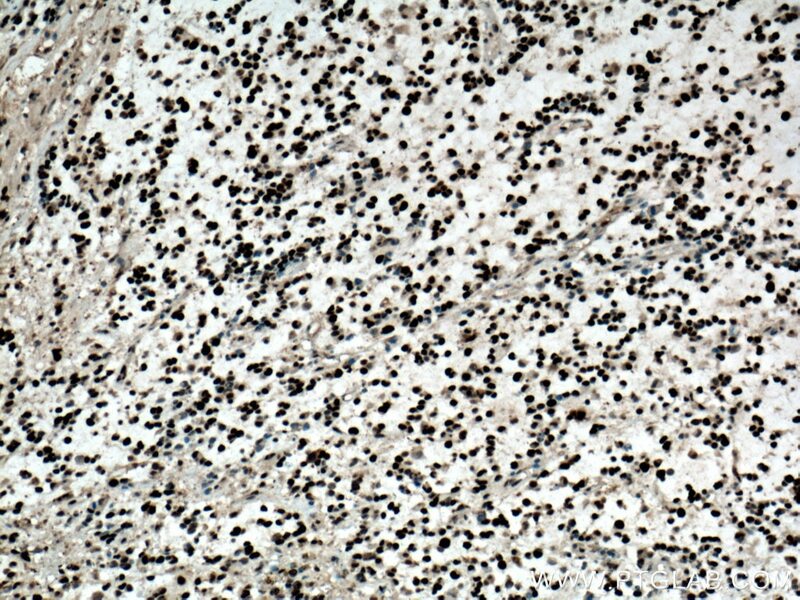 Immunohistochemical analysis of paraffin-embedded human gliomas tissue slide using 60097-1-Ig (PCNA antibody) at dilution of 1:1000 (under 40x lens) heat mediated antigen retrieved with Tris-EDTA buffer(pH9). 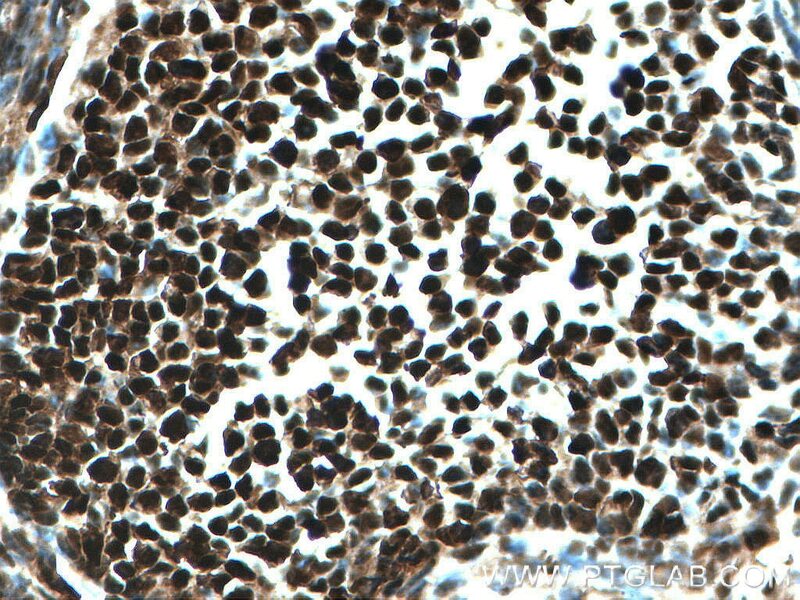 Immunohistochemical analysis of paraffin-embedded mouse ovary tissue slide using 60097-1-Ig (PCNA antibody) at dilution of 1:1000 (under 10x lens) heat mediated antigen retrieved with Tris-EDTA buffer(pH9). 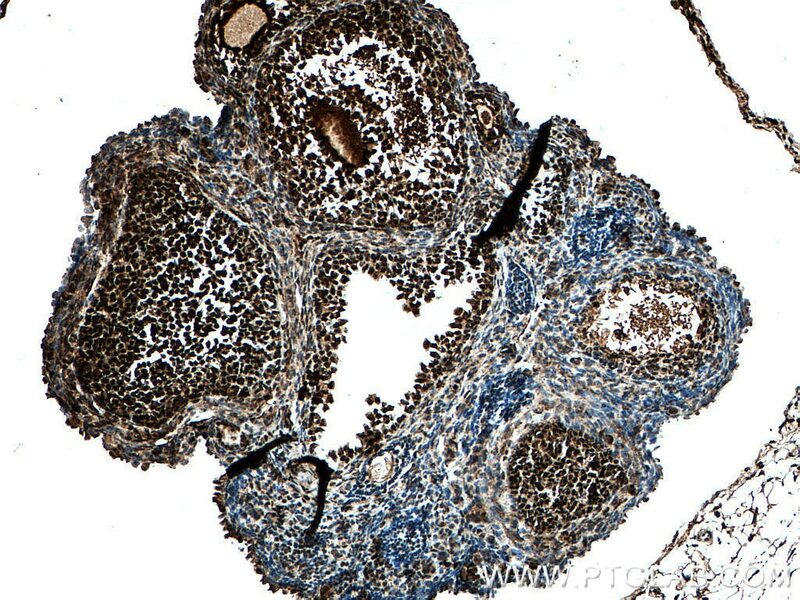 Immunohistochemical analysis of paraffin-embedded mouse ovary tissue slide using 60097-1-Ig (PCNA antibody) at dilution of 1:1000 (under 40x lens) heat mediated antigen retrieved with Tris-EDTA buffer(pH9).